In the 19th century, a stockbroker envisioned his new mansion to stand out from the crowd. And the result certainly does. 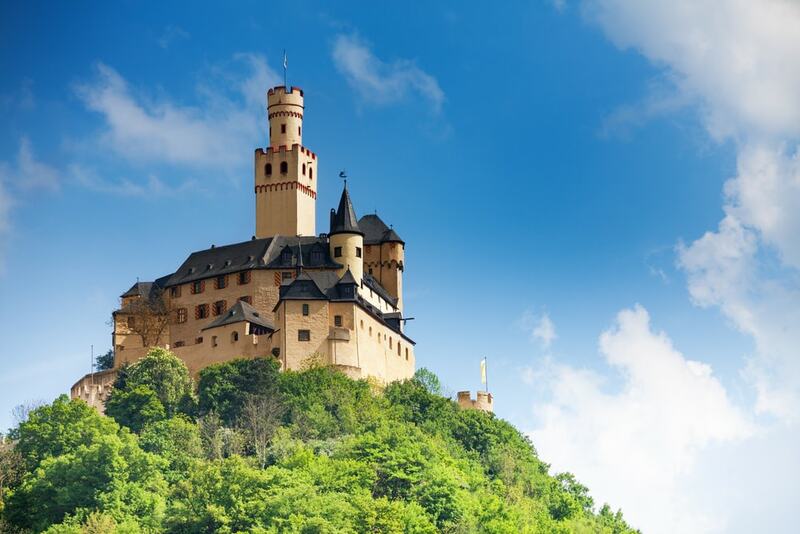 Atop a hillside near Königswinter and overlooking the meandering Rhine River, he built the dreamy Drachenburg Castle. After he passed away, the villa was repurposed several times before Allied bomb raids damaged it. A private investor saved the castle from being knocked down at the last minute and opened it to the public. Pompously decorated rooms, the vast gardens and stunning views over the river draw tourists to the site year-round, but the annual Christmas market is extra magical. Farther up the stream, the Ehrenbreitstein Fortress towers on a hill across the river from Koblenz. The fort as it stands today was built in the early 19th century and used as a Prussian military base, though its origin dates back to a Conradine fortress from around 1000. But long before the foundation was laid, the Romans recognised the strategic importance of the Koblenz region. A cable car takes visitors from Koblenz across the river and up to the castle. 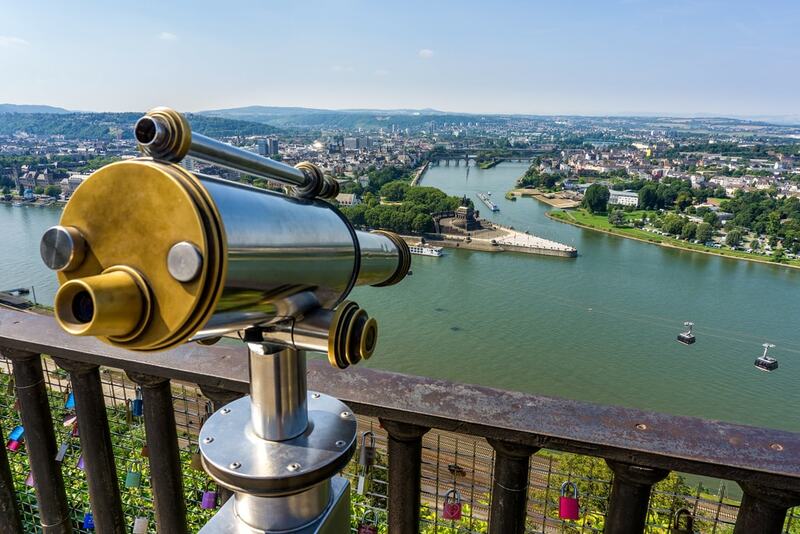 From 113 metres (371 feet), you will have panoramic views of the city and the Deutsches Eck monument, which marks the confluence of the Rhine and Moselle rivers. 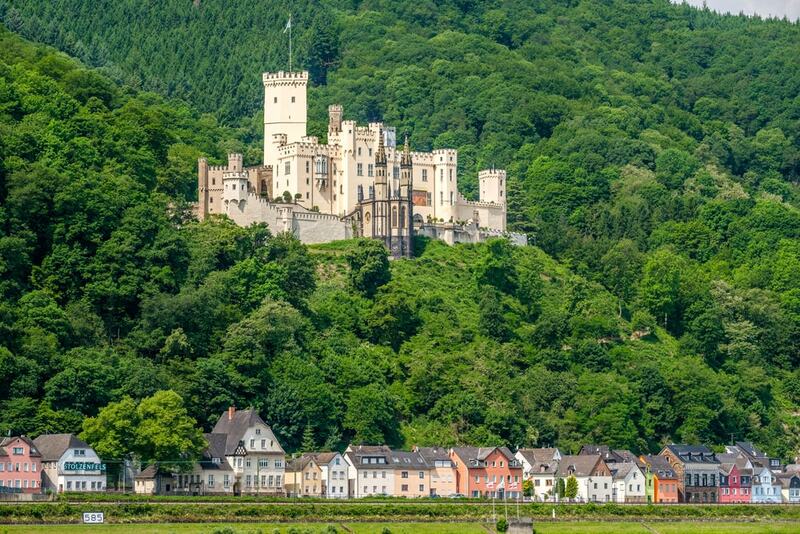 Just a few kilometres outside of Koblenz, Stolzenfels Castle is nestled on a forested hillside on the left bank of the Rhine. 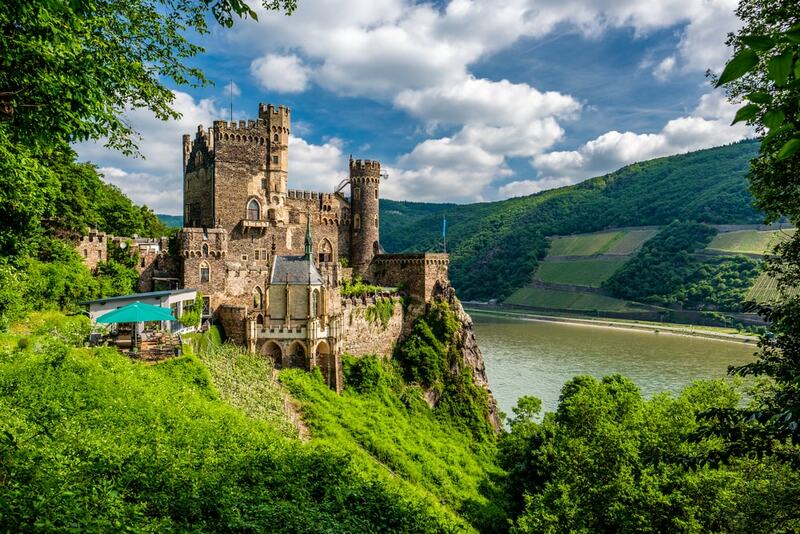 The fortress castle is the epitome of the romantic atmosphere for which the Upper Middle Rhine Valley is known. Prussian Prince Frederick William had the palace rebuilt from its 13th-century ruins and created a prime example of Rhine Romanticism. A tour of the castle and the grounds is one of the highlights of a cruise up the river. High on a hill in Braubach sits the Marksburg Castle, built in 1117 and the only hilltop castle of the region never destroyed; it is preserved with all of its medieval charm. The prominent castle keep gives away that the estate was primarily used to protect the town rather than as a residence, and a visit catapults you into the Middle Ages. A tour takes you around the kitchen, knight’s hall, chapel, armoury chamber, wine cellar and more. In 1245, the ruling count commissioned the construction of the toll castle to collect customs from the shipping traffic up the Rhine River. 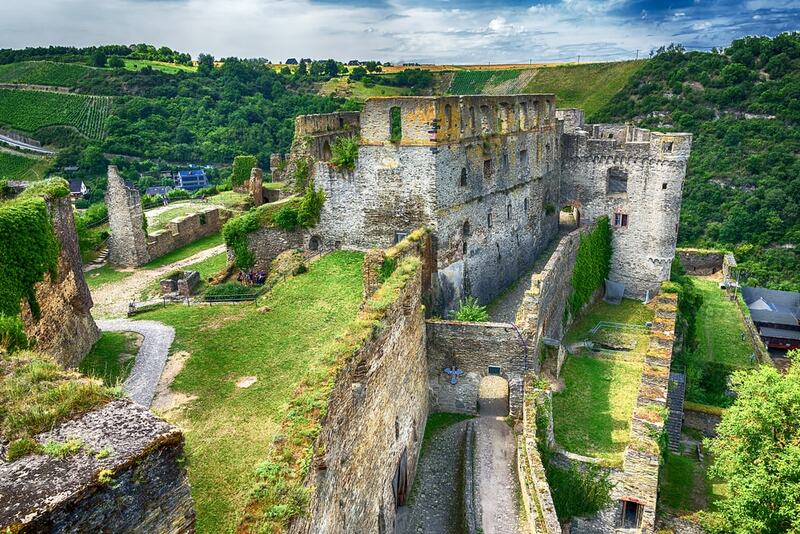 After expansions, Rheinfels Castle was the largest fortress of the Middle Rhine between Mainz and Koblenz, and after successfully standing a siege, it was believed to be impregnable – it wasn’t. With wars and besiegements, the castle changed hands several times over the course of history, and today, the crumbling walls have turned parts of the fort to ruins. Better preserved sections house a luxury hotel and a museum that details its turbulent history. The iconic Lorelei rock formation near Sankt Goarshausen is shrouded in myths revolving around a beautiful maiden who sat atop the cliff and serenaded sailors with her voice. Hypnotised by her singing and determined to reach the beauty, sailors would crash at the treacherous rocks and drown. The story has inspired numerous songs and poems, and a statue at the top pays tribute to the saga. The setting of Pfalzgrafenstein Castle is somewhat unique. 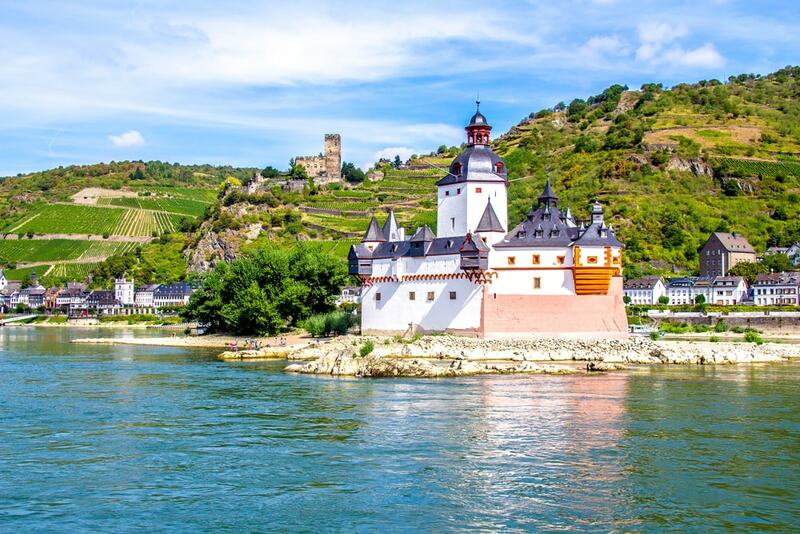 Sitting on an island in the middle of the Rhine River, the white façade and grey-roofed castle contrast with the lush hills of Kaub. The toll castle, built between 1326 and 1327, initially served the sole purpose of levying customs of the passing ships. A 100-year-long stint as a beacon ended in 1960, and today, daily ferries take tourists to the site. Towering 160 metres (525 feet) over the Rhine, Stahleck Castle spreads its medieval charm all across the valley. The 12th-century fortification was destroyed in the late 17th century, but it was rebuilt a few hundred years later. The castle is quite the eyecatcher – the brick and half-timbered façade is crowned by a grey-shingled roof. But the days of knights and damsels are long over, and Stahleck Castle is now a hostel with all modern-day amenities. 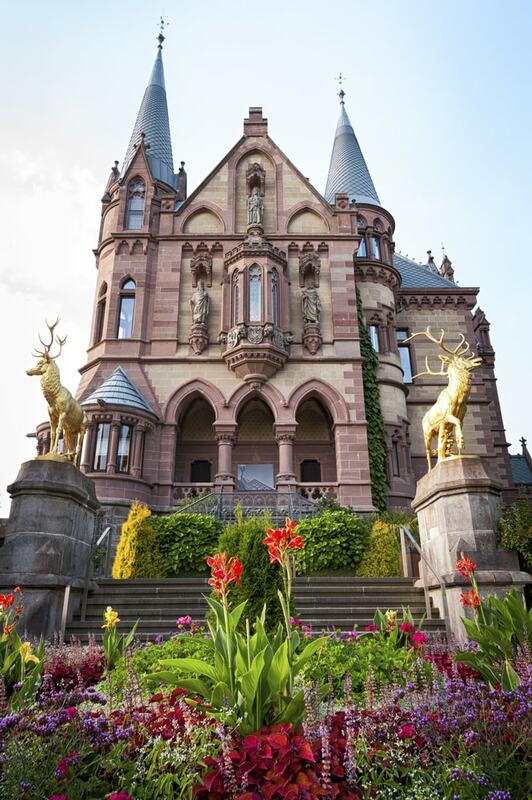 For a more upscale stay with jaw-dropping views over the Rhine Valley, Rheinstein Castle is just the right place. The construction started somewhere around 1316/17, but decline set in after only a few decades. By the time of the Nine Years’ War, the castle seemed beyond saving, but Prince Frederick of Prussia eventually bought and rebuilt the castle. Today’s on-site hotel and restaurant bring back the flair of the romantic period with fantastic food, stunning vistas of the vine-class hills across the river and a museum dedicated to the long history of the castle. Up the stream towards Rüdesheim, a gigantic monument appears on a hill on the east bank of the Rhine. 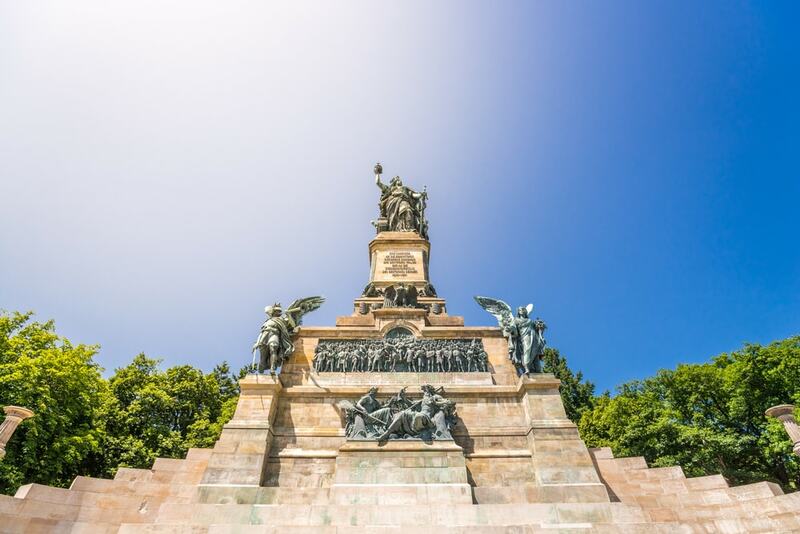 In commemoration of the 1871 unification of Germany after the Franco-Prussian War, the Niederwald Monument soars 38 metres (125 feet) over the river that once separated the two nations. From here, you have panoramic views of the valley and the town of Bingen on the other riverside. 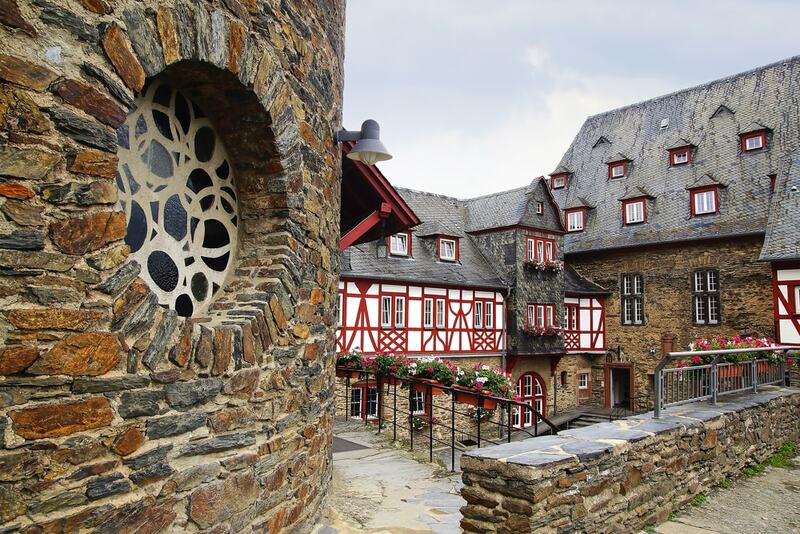 Just around the corner from the imposing Niederwald Monument is Rüdesheim. A stop at the enchanting riverside town is a perfect opportunity to sample some of the award-winning wines from the vineyards you passed on your way here. The cobblestoned streets lined with quaint shops, taverns and half-timbered houses are a bonus.